The PlatterTracker?, in several seconds, will eliminate the questions normally surrounding the use of turntable stroboscopes because in entry level to upper mid-quality systems, it eliminates the need for a stroboscope altogether! If you still wish to use an analog stroboscope for any level system, the PlatterTracker? will provide added confirmation of their proper use for the stroboscope user that desires a 2nd opinion that does not break the bank. Our "PlatterTracker?" 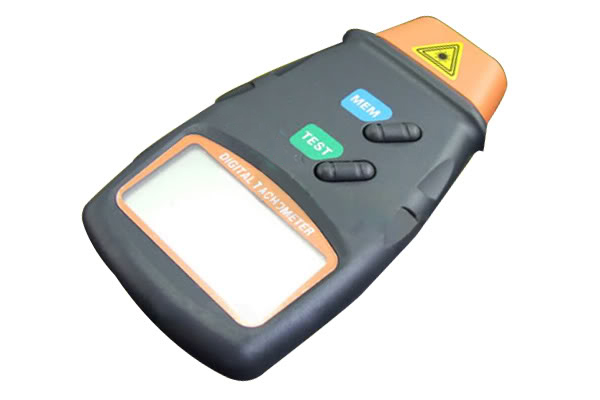 digital stroboscope uses laser technology combined with a simple photo transistor to look for dark and light transitions. Once you have equipped your turntable platter, mat, or un-cherished record label with a small piece of reflective tape (included), you simply point the PlatterTracker? at your reflective tape and within several seconds you will have a reading of your average platter speed. Whether it should be 16, 33.3, 45 or 78rpm you will know your record platter's speed to within 0.1 RPM's. If you suspect a marginal motor, belt or excess drag pulling on the motor and belt, the PlatterTracker? can assist your diagnosis. Simply take a reading without the mat and record in place. Then take another reading with the mat and a record on your turntable or record player platter. If your average speed slows more than approx. 0.2 RPM you may possibly have a marginal belt, old grease at the center spindle, a marginal motor or drive electronics, thus justifying deeper troubleshooting. We suggest you hold the PlatterTracker? as steadily as possible for the most accurate readings.
? Wide measuring range & high resolution.
? The last value/min . value will be automatically stored in memory. Retrieved via MEM button.
? The RPM of motors, rotating tools, turntable record players and machine parts.
? The housing has been carefully shaped to fit comfortably in either hand.
? Digital display gives exact RPM without guessing. easy and fast to use, much quicker than the paper disk. Excellent tool. A must have especially when the speed rotation screws are underneath the platter. I added this to my test gear and was surprised to find how "off" even turntables with built-in strobes could be. Takes a little experimenting to find the optimum length of reflective tape. I used velcro to mount mine on a little camera tripod and use it all the time. Does anyone really need their own stroboscope? The answer is yes if, like me, you sleep better at night knowing your turntable platter maintains the right speed despite belt changes and the wear and tear of the years. And nothing I've seen does the job better than this digital stroboscope. What's not to like about a gadget which needs almost no instructions, and is cheap, compact, and deadly accurate? Where was this easy-to-use device all my record-playing life? After getting back into playing our old 45's a year ago, I grew concerned my old turntable wasn't right on 45 rpm. I purchased the Stroboscope and discovered it was running slow. I got a tremendous amount of help from the Turntable Needles staff in trying to speed it up but, ultimately had to buy a new (used) turntable that is adjustable. Thanks to the Stroboscope my turntable is dead on 45 rpm and will stay that way. I'm Very happy I purchased it. If your recording old vinyl records to CD or Mp3, you should have one of these meters. It really works to help you see and set turntable to the correct speed. Unit is a little difficult to use. After a little practice holding it still, you can get the light to hit the mark and get a good speed reading. It seems to be accurate. Good tool to have for turntables without a strobe. Love this item. Easy to use for any revolving item. I tried it with a half-inch piece of the tape and it worked perfectly. It'll work with any small reflective material if you run out of the supplied tape. Finally I can check my reel-to-reel recorders, turntables, machine tools. Very happy! It is four times cheaper than another top rated turntable stroboscope. I have both of them and checked that the measurements from both of them were identical to the decimal points. At first, I cannot believe it can work as it is so simple to use. I found out eventually it is as good as the much more expensive stroboscope and even easier to use. It is one of the most amazing products that I have the good fortune to come across. .
For $ 24 , a great item to get reasonable TT platter speed. Just bought another new MC Cartridge and will recheck readings of course. Very easy to use ! Great item! Quickly received. Accurate and quite easy to use. Available here at an unbeatable price. Thank you! It's really useful to calculate the platter speed of a turntable. Hold it with firm hand, place a small piece of reflective strip on the platter and flash it during rotation. I prefer it much more than the strobe disc. Precision is good: nominally it's 1/10 round, but in the real world is more like 0.2-0.3 unless u have a really firm hand. It displays min value, max value, average value. My Pro-ject Debut Esprit Carbon always stays on 33.2 or 33.3 on average. A must for turntable enthusiasts. Works as described. Consistently on the mark in terms of determining TT speed. I found that putting a black sheet of paper over spindle and surrounding record label area, then applying supplied reflection tape marker worked really well. Works as described and expected. Well worth the price paid. This thing works precisely as advertised. Not sure about utility of info because new TT has no adjustment if speed is not right, but you can tell exactly what it IS doing. I am so pleased to have this! Works great and helps me set my table up precisely! Get one! Excellent product, and best for adjusting the correct turntable speeds. I found sticking the reflective tape on the rim of the platter preferable to putting it on the platter near the spindle. Very easy to use and the price is right too. I tried other methods of speed adjusters but this one is the tops. Anyone who owns a turntable and cares for correct tonality should definitely acquire this gadget. I was a little suspicious due to low cost of this item, but has proven to be quite effective and well worth the money. Thanks Guys. This is ideal for checking the RPM on turntables and more. Straight forward design makes it simple to use. Very good product. Was able accurately set speed on turntable. Highly recommended. Inexpensive in comparison to other. Very happy with digital platter tracker! Great product at a great price. I use this little device with my VPI SDS to dial in the exact speed on my 20 year old turntable! Very happy -works as advertised.
? Display: Large 5 digit, 18mm LCD.